Welcome to fellow author M.J. Bell, also author of The Chronicles of the Secret Prince trilogy. Previous interviews with Richard Bamberg, Rob Chansky, P.R. Adams, Megan Rutter, and Jason Dias are also available. 1. I know you worked hard on making the time travel as accurate as possible. Can you tell me (well, the blog readers really, since you’ve already told me) which theory of time travel you picked, why you picked it? I wanted to write a time travel story for as long as I can remember. But I wanted it to be scientific, not magical, and that was a problem since a normal person, like my main character, Kat, had no way of getting access to a rocket ship to fly close to a black hole or fly at the speed of light, or access to a wormhole or cosmic strings—the only ways time travel is possible, according to the top physicists of the world. And though I could have just made something up, I don’t have a scientific brain and I knew readers are savvy and I didn’t want to disappoint them with some lame excuse of a time machine. But I kept researching, hoping to find a way, and a couple years ago, I found it—an article about a college professor back East who had developed a hypothesis that stated that light could bend the space time continuum into a loop in which a person could then travel forward in time. At that time, he was also in the process of building a real time machine. The minute I read that, I dropped the story I was working on and immediately started writing Next Time I See You. It didn’t really matter if the professor got his time machine to work or not (and as far as I know, to date he still hasn’t), his hypothesis was a solid, scientific base for me to use, and after doing extensive research on quantum physics and talking the subject over with several physicists, Kat’s time machine was born, and I have no doubt that someday the professor will get it to work! And I don’t know that my character, Kat, would have gone through with it either if she had been able to process her grief in a normal way and been in her right mind. But she wasn’t. She went to a very dark place after the shooting and the dementors had swooped in, circling overhead and sucking her life out. At the point she discovered the time machine, she had lost just about everything and didn’t feel like she had anything left to lose. 3. All right, what other time travel books/movies/shows do you actually like? Or do they all just drive you nuts? Well, who doesn’t love the Back to the Future movies? I also enjoyed the first three Outlander books and the TV series, but not so much because of the time travel aspect—because of the history and Gabaldon’s writing. But to be truthful, a lot of time travel books and shows drive me nuts! I can’t help but pick out the inconsistencies, and it always drives me crazy when a person from our time goes back hundreds of years and is able to fit right in. I think that’s why I always wanted to write a time travel. I was going to make my character have a hard time and fumble everything, because realistically, I think that’s how it would happen. A person from this time, who is used to technology and all the conveniences we have today, would not have a clue as to how to deal without. But then, as it turned out, Kat only went back in time sixteen months, so she didn’t have to deal with a different time period. Although, there were still plenty of hurdles for her to get over! 4. As you know, I got waaaay too involved with the main character and was very upset that she was being put through the wringer in the beginning of the book. How did you add so much tension? I’m sorry I put you through that, but I wanted readers to be inside Kat’s head, and as I mentioned earlier, that wasn’t a pleasant place to be. But it made for great tension and that was necessary to the story. I also wanted readers to understand she wasn’t a bad person. She was just very broken and with good reason. And she needed to be backed into a corner and desperate enough to make the decision to kill the POS. Otherwise, there wouldn’t have been any story to tell! 5. What are you planning for your next project? As in, how do you follow a book like this?!? Ha! One of my favorite TED talks is by Elizabeth Gilbert, author of Eat, Pray, Love. She starts out talking about how after the success of that book, people would come up to her, pat her on the arm, and look at her with sympathy and say, “Wow, how are you ever going to top that?” I’m not anyway close to being on Gilbert’s level, but I kind of feel the same way – what am I going to do now to top this! I loved Kat’s story and it is hard to move away from it, but I still have that urban fantasy that I put aside to write Next Time I See You. I’m getting back to it, researching facts and logistics and I’m sure in another month or so, I’ll be completely involved with it. The title of it will be Three. The experience Kat had in meeting the blue-eyed stranger (a.k.a Blue-eyes) was actually taken from a personal experience. It was long, LONG ago, but I still remember it as if it was yesterday. A friend and I were taking our daughters to their first concert, and due to the size of the event, we had to park quite a distance from the stadium. Fortunately, they had shuttles set up to transport us. When we got on the shuttle, all seats were taken and we had to stand in the center aisle. I turned and looked behind me and straight into the most mesmerizing blue eyes I have ever seen. I have never to this day seen eyes that color, and just like Kat, I instantly felt queasy and started shaking all over. It was the most intense déjà vu experience I’ve ever had. My friend and no one else around me seemed to be affected the same way I was, but I swear, I could have sat and stared into those eyes for the rest the night. All I did, though, was throw a few glances his way, as many as I felt I could get away with, because he was a stranger and I didn’t want to be caught staring. The shuttle ride was way too short and before I knew it, we were off the bus and going our separate ways. Those eyes have haunted me ever since and I’ve always regretted not knowing his story, and never thought I would find it out. But then he appeared again in this book, and Kat, being a lot braver than I, was able to uncover the answer for both of us. It’s there in Next Time I See You, if any of you are interested in knowing it too! 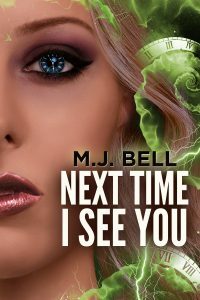 M.J. Bell is an award-winning author (Gold in the Mom’s Choice Awards) of the Teen/YA Fantasy trilogy, Chronicles of the Secret Prince, and the science/fantasy, Next Time I See You. Having escaped the mosquito-infested land of Iowa where she grew up, and the scorpion-infested land of Arizona where she was transplanted for way too long, she now lives happily ever after in Colorado, spreading magic wherever she can as a full-time writer, full-time babysitter, full-time cheerleader, full-time cook/housekeeper, and full-time taxi cab driver.